The Rotary Club of Georgetown, Texas hosted their first ever Field of Honor event over the past week. So far, they have raised over $8,500 using DipJar to support and honors veterans and first responders! 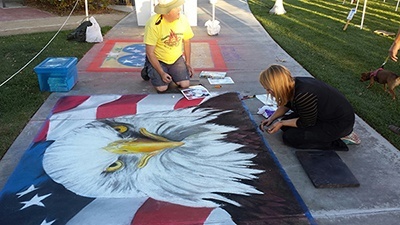 This event features an inspiring display of 1,400 full-size American flags. Each flag is purchased by individuals in tribute to a veteran, active or reserve duty military, first responder, or their own personal heroes. "We knew we would sell many more on-site, but we have no wi-fi at the park, and trying to set up a hotspot and use wi-fi for credit card readers is too unreliable and also not secure. Another organization in Georgetown, the Boys and Girls Club, had used a DipJar at a fundraiser earlier this year, and they loved it, so we decided to give it a try. We are so happy we did! Credit card purchases have outpaced cash and check purchases 3 to 1." So far, The Rotary Club of Georgetown was able to sell an additional 214 flags on-site due to DipJar! This additional fundraising helped to benefit local veterans and first responders as well as provide training for service dogs that support veterans with PTSD.